Last night's SmackDown was very much a tale of two hours. The first hour dragged with poorly constructed women's segments. It slowly picked up with a big debut, and then the second went into hyperspace, with one of the most memorable WWE matches this year so far. The crowd picked up with the show, being rather tepid in the first hour but came alive in the second hour with the gauntlet match. 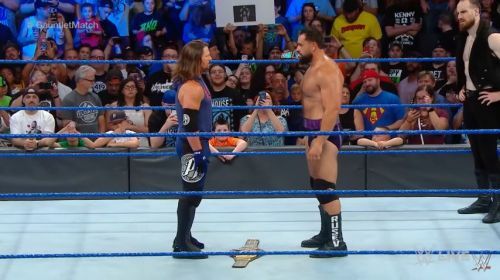 Like Raw, it looks like the blue brand is heading out of its post-WrestleMania lull and slowly building to SummerSlam, with many fans being sent home happy with a good kind of swerve, rather than a poorly constructed one as we've come to expect. Extreme Rules is already showing some promise on the blue brand's side, and only one match has been officially announced. Who walked away winners on SmackDown last night, with four weeks to go until Extreme Rules? This one is admittedly hard for me to judge. On the one hand, she came out to no reaction as usual, nor was the crowd terribly into her promo except in a few small chunks, but that was neither loud nor sustained. In comparison to Alexa Bliss the night before, she proved once again that she's, at best, the poor man's version, and is in no way a championship caliber act. On the other hand, James Ellsworth delivered a bit more pop, and his interaction with Asuka was the highlight of the segment. Unfortunately, Asuka looked like an idiot again, losing focus on Carmella after attacking Ellsworth. This got some boos, but not long lasting ones. Carmella certainly needs Ellsworth and Asuka to play off on. Though this segment was better than the usual kinds of Carmella segments, she once again proved that her reign is the weakest part of SmackDown, because compared to the rest of the night, this was the hiccup. Hopefully, she drops the title at Extreme Rules and we can move on to Asuka and Charlotte at SummerSlam.